There will be no more Internet Protocol version 4 (IPv4) addresses by the end of 2011 due to IP address space exhaustion. Because of this, Internet traffic will be using the next-generation Internet Protocol version 6 (IPv6) addresses. A number of prominent websites will be participating in World IPv6 Day and will be offering their content using IPv6 in addition to IPv4. There are websites, however, that may be supporting IPv6 only. If your system is not ready for IPv6 transition, you will not be able to access those sites. IMPORTANT: An IPv4-only computer can connect to IPv6 and IPv4-capable sites. However, when a site is IPv6 capable, networks that can speak IPv6 will prioritize connecting with IPv6 to reach those sites. NOTE: To know how to enable IPv6 on your Linksys Wi-Fi Router, click here. On the Address bar, enter “http://test-ipv6.com” and press [Enter]. You will then see a window informing you that the test for your computer’s IPv6 connectivity is starting. 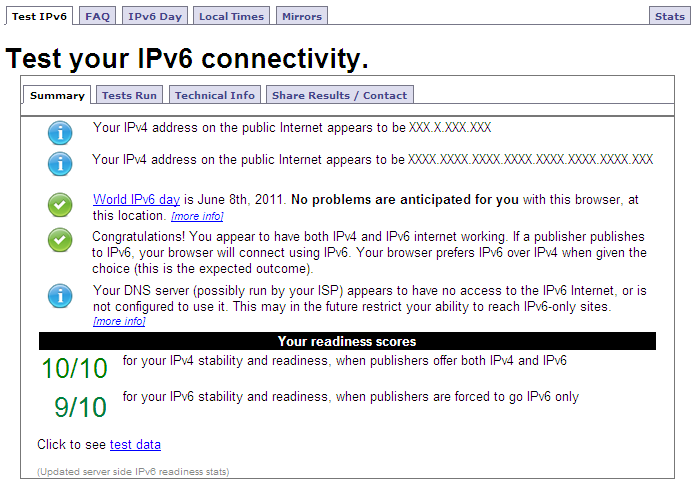 Once the test finishes, you will be able to see whether your computer is IPv6-capable or not. If you get the message No Problems are anticipated for you, your computer’s IPv6 connectivity is likely problem-free. 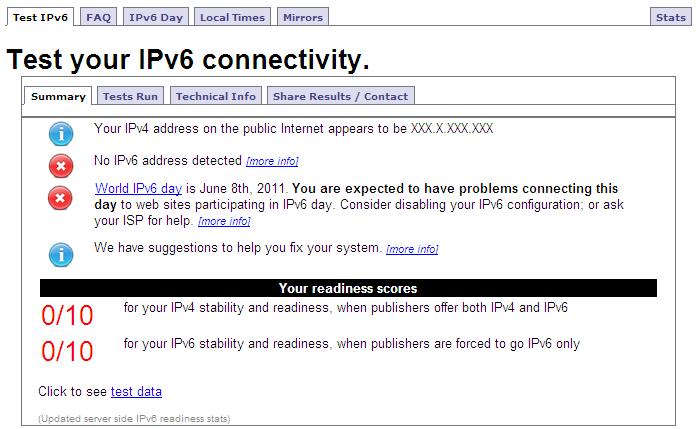 If you get the message You are expected to have problems connecting to this day, some IPv6 diagnostics will be needed to ensure you have no problems on World IPv6 Day.